Ethernet over Coax is not a new concept. Early variants of the Ethernet standard used coaxial cable as the communication medium. Ethernet is a family of frame-based computer networking technologies for local area networks (LAN�s). The name comes from the physical concept of the ether. It defines a number of wiring and signaling standards for the physical layer, through means of network access at the Media Access Control (MAC)/Data Link Layer, and a common addressing format. Ethernet over coaxial cable is not a new concept. Ethernet was originally developed at Xerox PARC in 1973�1975 and was based on the idea of computers communicating over a shared coaxial cable acting as a broadcast transmission medium. From this early and comparatively simple concept, Ethernet evolved into the complex networking technology that today underlies most LAN�s. The coaxial cable was replaced with point-to-point links connected by hubs and/or switches to reduce installation costs, increase reliability, and enable point-to-point management and troubleshooting. StarLAN was the first step in the evolution of Ethernet from a coaxial cable bus to a hub-managed, twisted-pair network (10BASE-T). The advent of twisted-pair wiring dramatically lowered installation costs relative to competing technologies, including the older Ethernet technologies. Despite the significant changes in Ethernet from a thick coaxial cable bus running at 10 Mbit/s to point-to-point links running at 1 Gbit/s , all generations of Ethernet (excluding early experimental versions) share the same frame formats (and hence the same interface for higher layers), and can be readily interconnected. Two significant generations in the development of Ethernet are discussed below. 10BASE5 (also known as thicknet) is the original "full spec" variant of Ethernet, using special cable similar to RG-8/U coaxial cable. This is a stiff, 0.375 inch (approx. 9.5 mm) diameter cable with an impedance of 50 ohms, a solid centre conductor, a foam insulating filler, a shielding braid, and an outer jacket. The name 10BASE5 is derived from several characteristics of the physical medium. The 10 refers to its transmission speed of 10 Mbit/s. The BASE is short for baseband signalling as opposed to broadband, and the 5 stands for the maximum segment length of 500 metres (approx 1600 feet). 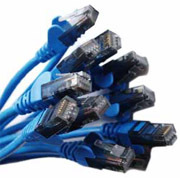 10BASE2 (also known as cheapernet, thin ethernet, thinnet or thinwire) is a variant of Ethernet that uses thin coaxial cable (RG-58 or similar, as opposed to the thicker RG-8 cable used in 10BASE5 networks), terminated with BNC connectors. For many years this was the dominant 10 Mbit/s Ethernet standard, but due to the immense demand for high speed networking, the low cost of Category 5 Ethernet cable, and the popularity of 802.11 wireless networks, both 10BASE2 and 10BASE5 have become almost obsolete. 10BASE2 systems do have a number of advantages over 10BASE-T. They do not need the 10BASE-T hub, so the hardware cost is very cheap, and wiring can be particularly easy since only a single wire run is needed. These characteristics mean that 10BASE2 is ideal for a small network of two or three machines. For a larger complex office network the difficulties of tracing poor connections make it impractical. The name 10BASE2 is derived from several characteristics of the physical medium. The 10 comes from the maximum transmission speed of 10 Mbit/s (millions of bits per second). The BASE stands for baseband signalling, and the 2 represents a rounded up shorthand for the maximum segment length of 185 meters (607 feet). Unlike the earlier Ethernet standards 10BASE5 and 10BASE2 , 10BASE-T does not specify the exact type of wiring to be used but instead specifies certain characteristics that a cable must meet. This was done in anticipation of using 10BASE-T in existing twisted-pair wiring systems that may not conform to any specified wiring standard. Some of the specified characteristics are attenuation, characteristic impedance, timing jitter, propagation delay, and several types of noise. These characteristics are expected to be met by 100 meters of 24-gauge unshielded twisted-pair cable, and 100 meters is the stated maximum length for baseband signal runs. With all CSMA/CD network environments the absolute limit on run length is determined by the size of the collision domain and cable quality. A collision domain is a physical network segment where data packets can collide with one another when being sent on a shared medium, in particular, when using the Ethernet networking protocol. A network collision occurs when more than one device attempts to send a packet on a network segment at the same time. Collisions are resolved using carrier sense multiple access or a variant thereof in which the competing packets are discarded and re-sent one at a time. This becomes a source of inefficiency in the network. Network-IP Surveillance systems offer many benefits compared to analogue CCTV systems. However, a major hurdle to their adoption for upgrading existing sites is the necessity of new cabling. The cost of laying new Cat 5e cable for network devices can be significant and the cable length limitations of Ethernet can be restrictive. Ethernet over Coax Adapters can provide a means to re-use the existing analogue cabling to create new network connections. This is possible because, coaxial cable that may already be present on a site is potentially a better transmission medium for digital data than the UTP cable that would otherwise have replaced it. Coaxial cable has a higher bandwidth, with lower noise and signal loss, meaning it can carry more data for greater distances. One advantage of coaxial cable over other types of transmission line is that in an ideal coaxial cable the electromagnetic field carrying the signal exists only in the space between the inner and outer conductors. This allows coaxial cable runs to be installed next to metal objects such as gutters without the power losses that occur in other types of transmission lines, and provides protection of the signal from external electromagnetic interference. The transmission of energy in the line occurs totally through the dielectric inside the cable between the conductors. Coaxial lines can therefore be bent and moderately twisted without negative effects, and they can be strapped to conductive supports without inducing unwanted currents in them. If in doubt, run a transmission test. Cable testing is often limited to checking if a connection works with Ethernet, running faster speeds over existing cable may be problematic. A point to note is that Ethernet's auto-negotiation takes account only of the capabilities of the end equipment, not of the cable in between.